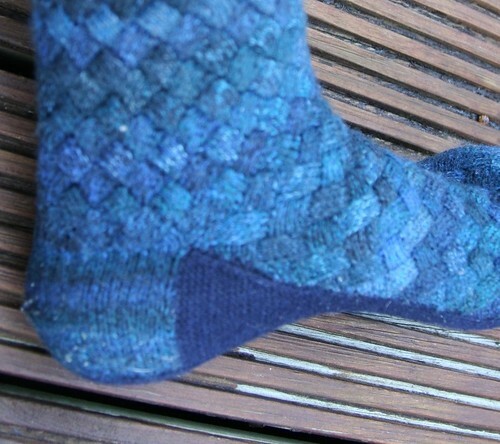 So a few years ago, I knit a pair of entrelac socks. This pair, in fact, in some hideous Trekking XXL colorway that included black, grey, chartreuse, yellow and kelly green. They were something else - fun to knit, definitely challenging, but they ended up too small for me. Entrelac definitely does not have the side-to-side stretch of stockinette, so I gave them to my Mom. 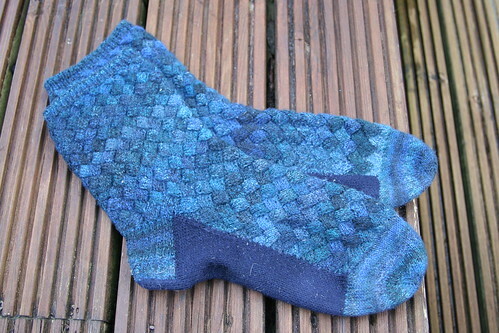 But I wanted to knit a pair that would fit me, and I wanted socks with entrelac on the top and stockinette on the sole. After a bit of mucking around, I came up with these. They ended up being for Himself - Trekking XXL for the entrelac, and a bit of Knit Picks Essential to finish off the heels and soles. I wrote the pattern up and submitted it to Knitty, but it didn't fit for them. Then last summer, I saw a call for sock designs for Sock Madness IV (which I've mentioned a bit before), and sent in the pattern for these. They liked it, and yesterday it was released as the final round pattern for this year's Madness. The construction is either ingenious or diabolical, depending on your mood. You start with the toe, and then put half the stitches on a holder. 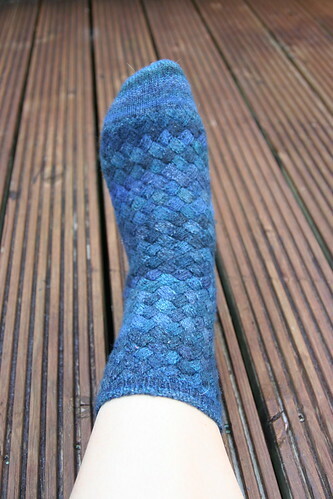 The other half are worked as a flat entrelac panel for instep up to the ankle. Then you provisionally cast on the rest of the stitches for the leg, and knit entrelac in the round up to the cuff. The heel flap and sole are worked down from the provisional cast on, and are attached to the instep flap at either side. So far there are six or seven pairs underway, including the four finalists. It's been a bit over 24 hours, and I'm thinking someone is going to be finished pretty darn soon. Which is amazing, since entrelac is not exactly a fast way to knit anything. If you're on Ravelry and want to watch the contest wind down, the group board is here. I will be releasing the pattern in three sizes in the near future, so keep an eye out for it here and on Rav. Written by porpoise On June 6, 2010 In "FO", "designs", "socks"